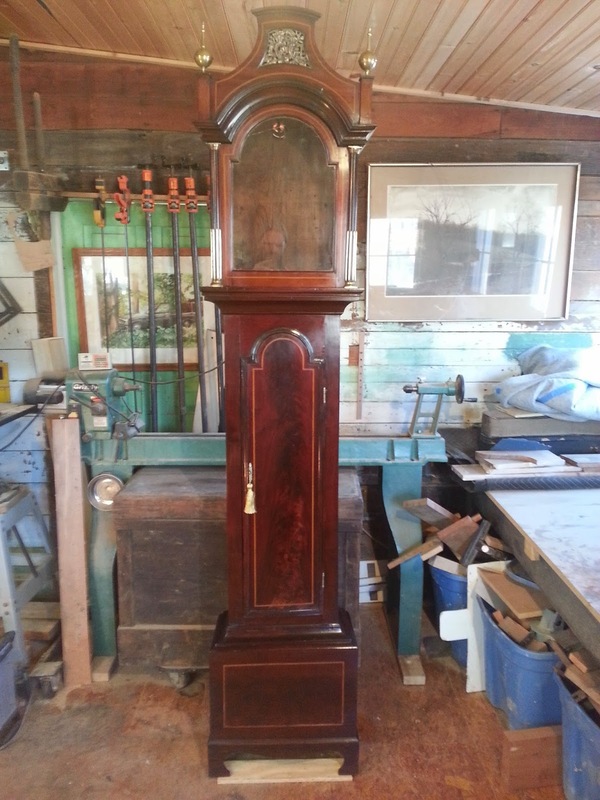 A recent project was the restoration of an English grandfather or longcase clock made in London ca. 1750. The case shows Rococo influence which was popular in England during the middle period of the 18th century. 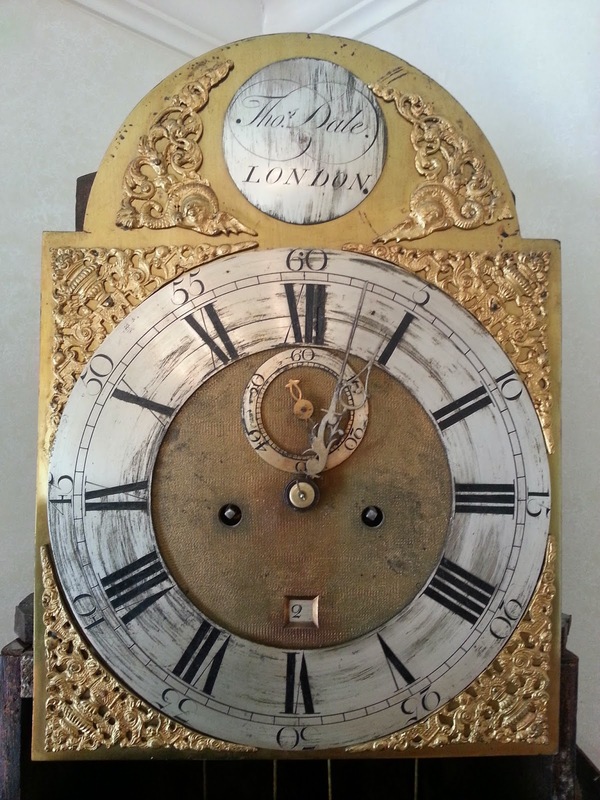 This particular clock case houses works by Thomas Dale of London. Below is a photo of the brass dial with silvered chapter ring and name plate followed by a close up of the name plate. The works appear to be eight day time and strike and include a hand that recorded the passing of seconds in addition to the minute and hour hand. Below is a photo of the works. The case itself was built from English oak veneered with fine West Indies mahogany. 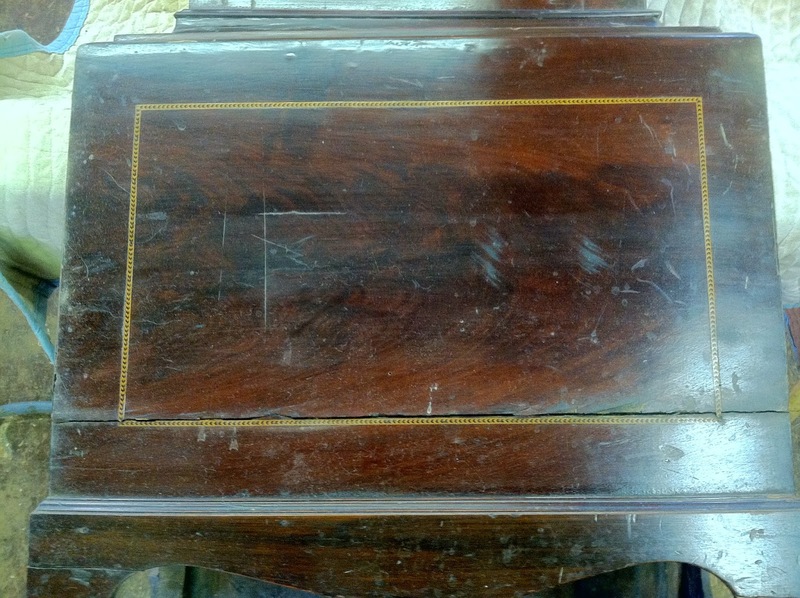 The mahogany was inlaid with banding made from several woods and the back of the case was made from elm. Pine was also used throughout as a secondary wood. 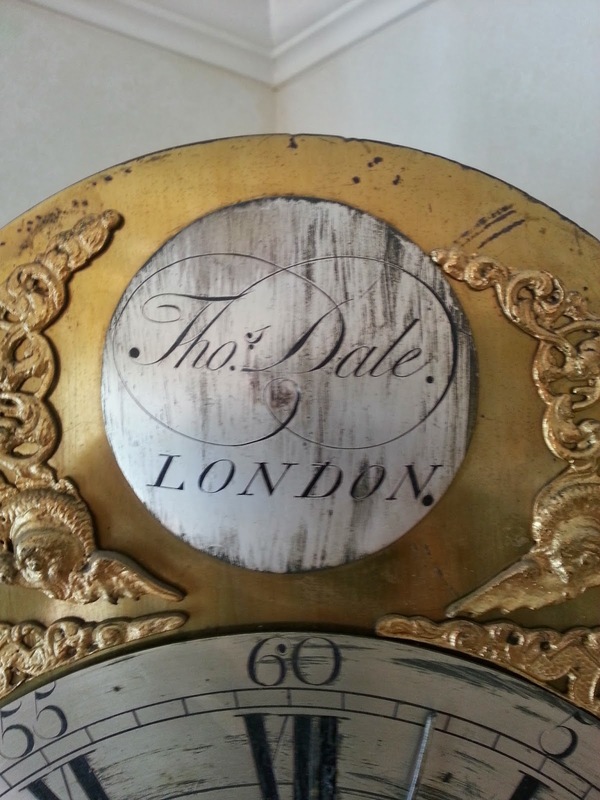 While I could not find working dates of Mr. Dale, the case design itself seems to be associated with the clockmakers of London, as the name plate demonstrates. In researching this clock, I found several examples of this case design an all of the examples I saw were associated with London clockmakers. The design specifics mentioned above are mainly seen in the bonnet and the waist door. These London examples had what is refered to as a Pagoda top, with a brass sounding fret centered above the clock face. The sounding fret exhibits the strongest influence of Rococo on the entire clock and I will discuss this further later in the post. Another design element common to the London cases was the fluted columns flanking the clock face with stopped reeding made from brass wire. 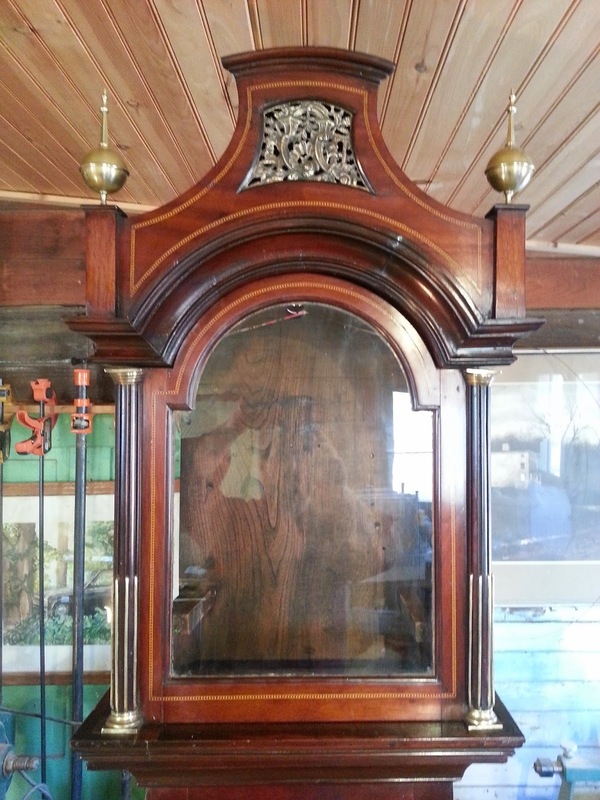 Below the bonnet, The applied molding on the waist door was common to these cases and was additionally seen in some cases on the base of the clock. 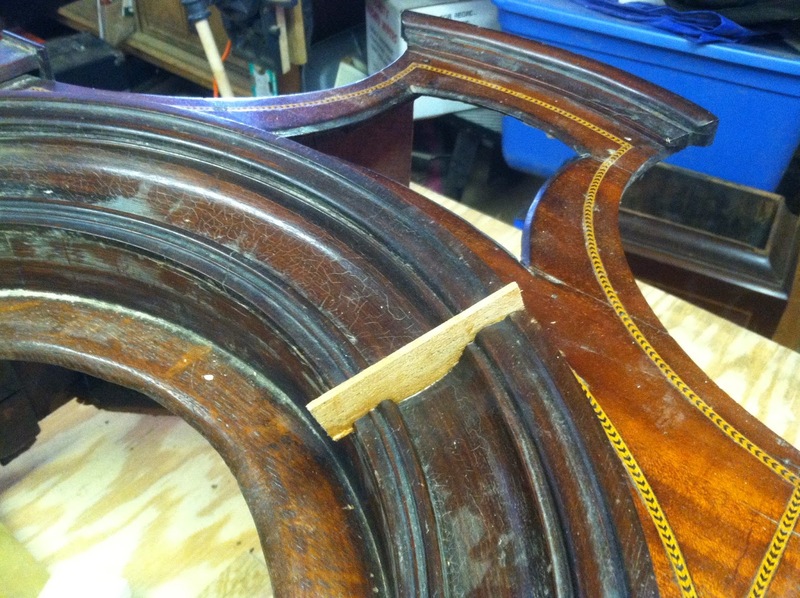 In this case inlayed stringing was favored over applied molding on the base. While none of these design element should be seen as being exclusive to London clock case manufacture, the combination of all of these design elements seems to point towards a popular style of longcase made in London during the mid 18th century. The date I ascribed to the case is a guess and the case could have easily been made earlier or later than 1750. If I had to choose, the use of Oak for the case construction would point towards an earlier date as pine was used later in the 18th century. 1750 seems to be a good compromise. 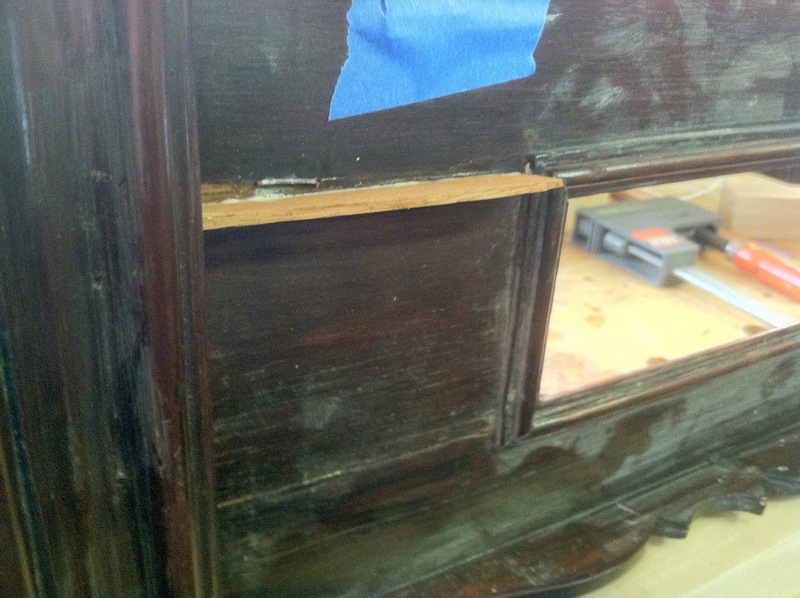 The case was very damaged when it came to the shop and beyond loose veneer, it required the repair of the decorative molding around the waist door and countless other patches and wedges. 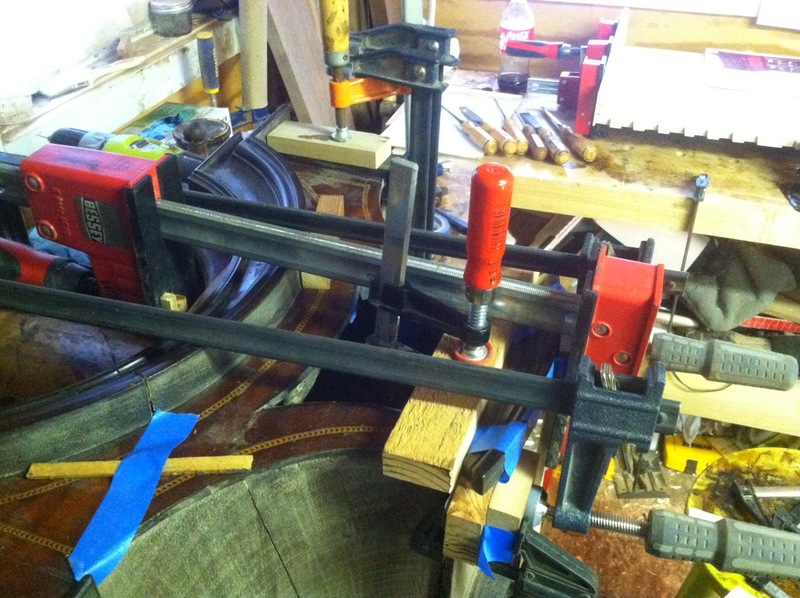 In addition, the base had separated from the waist and was only loosely attached by nails driven through the veneer. 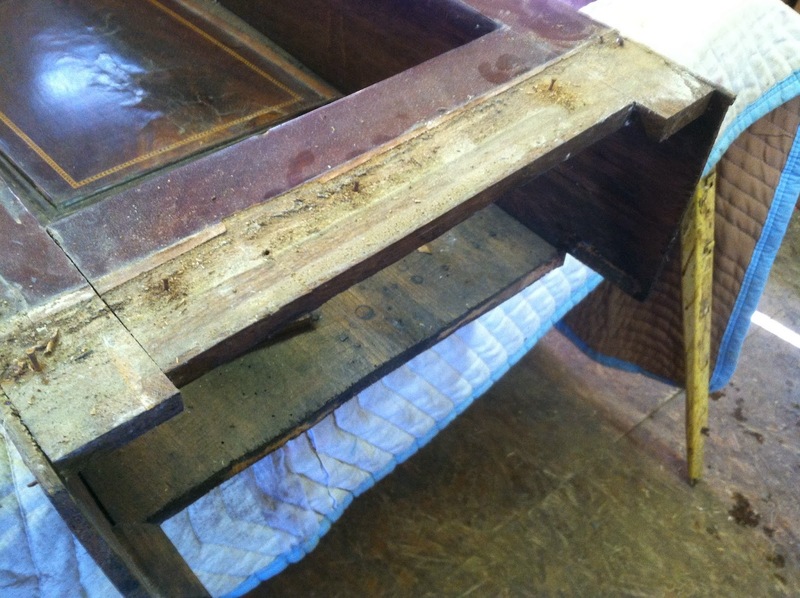 the repairs and restoration of the original finish are detailed below. I have separated the repairs into three sections to keep every thing straight. 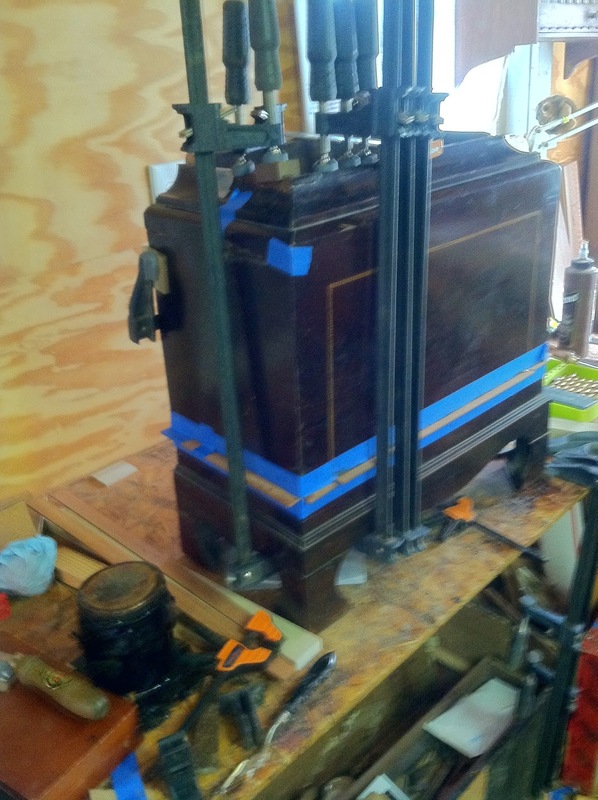 The base of the clock had broken feet, cracks in the veneer, a warped front, and several other smaller repairs that needed to be made. 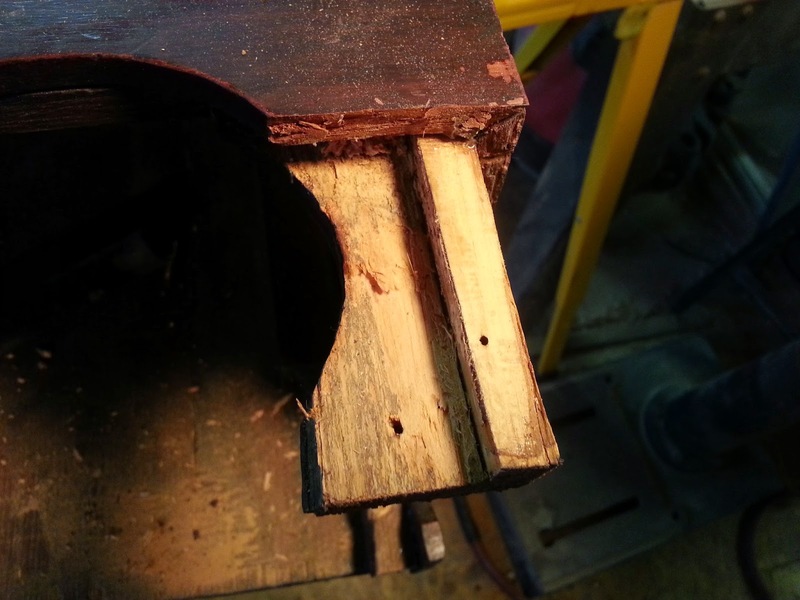 In addition, the back of the base which was made of pine and separate from the waist back, had broken along an old glue line. Below are a few photos of the base once removed for the waist. As you can see, the base's front and sides were cracked. 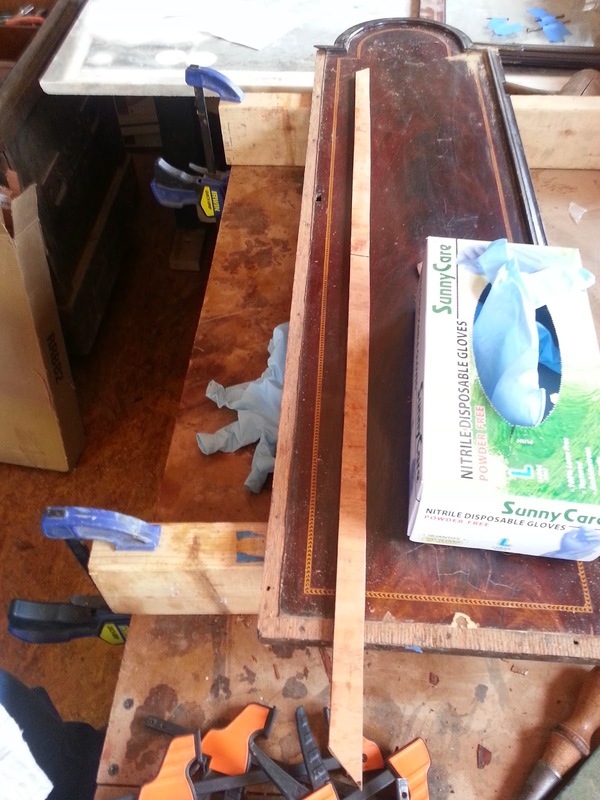 In addition, the front board beneath the crotch mahogany veneer was warped and needed to be secured from behind. 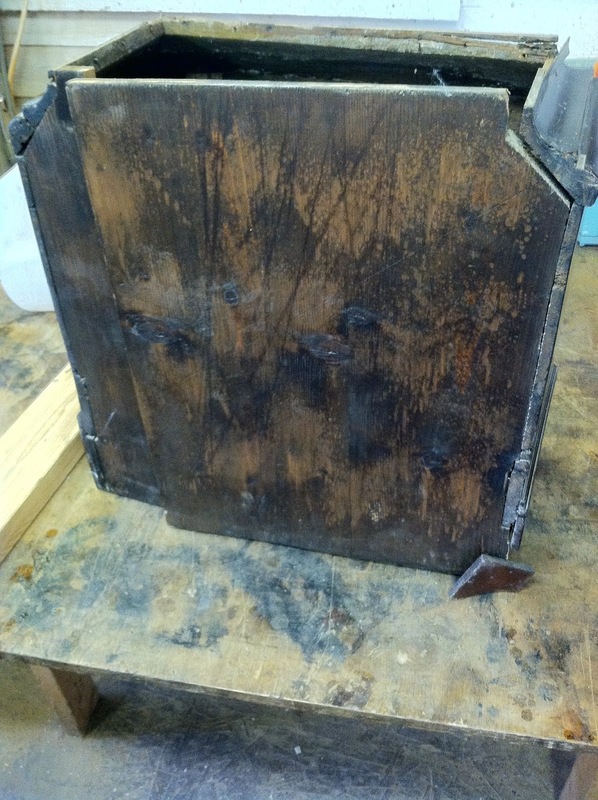 The following photos show the repairs to this section of the clock case. 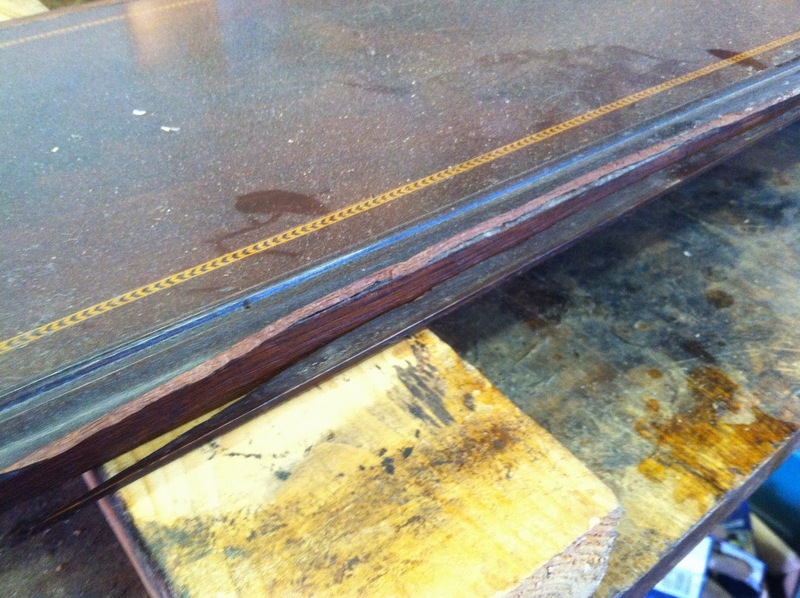 these first two photos show the secondary wood beneath the mahogany feet, which were cracked. 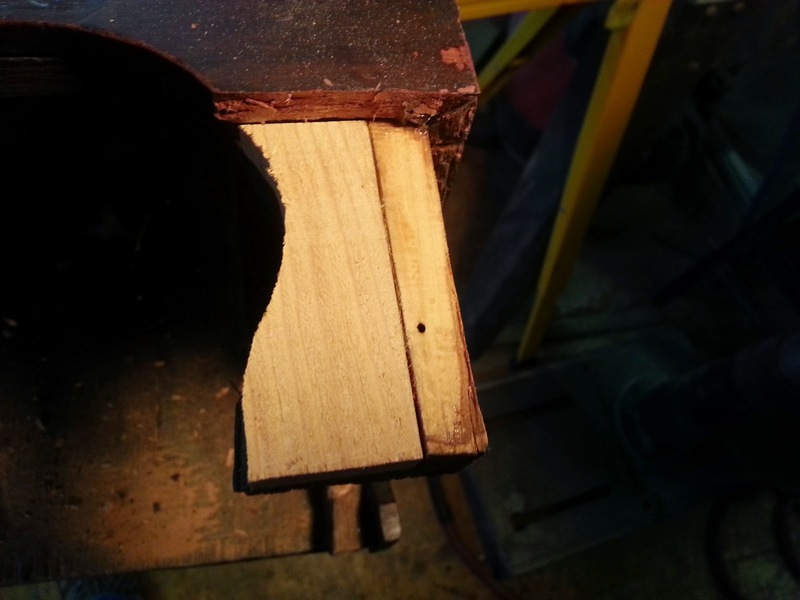 The pine board that supported the mahogany foot had rotted where it contacted the mahogany. 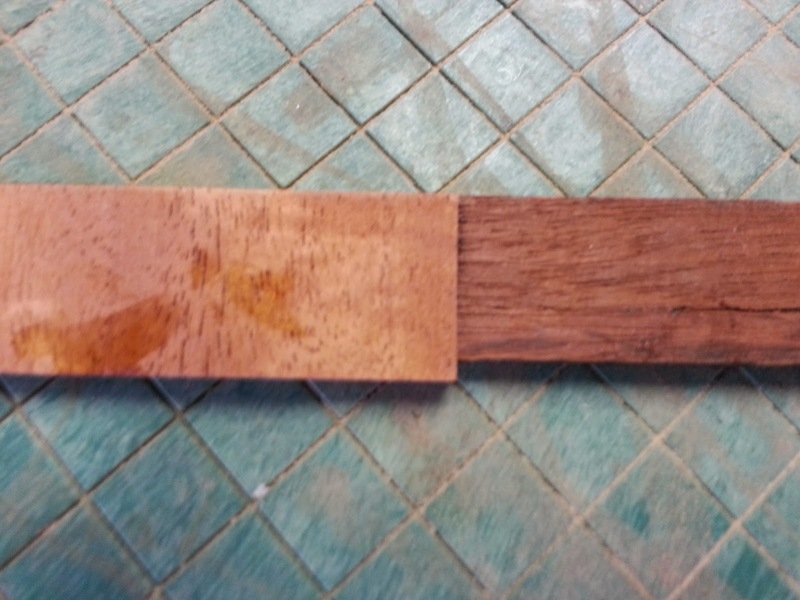 I pared this rot away with a chisel until I got to clean wood and then cut a patch using reclaimed pine to fill the gap, which can be seen in the following photo. 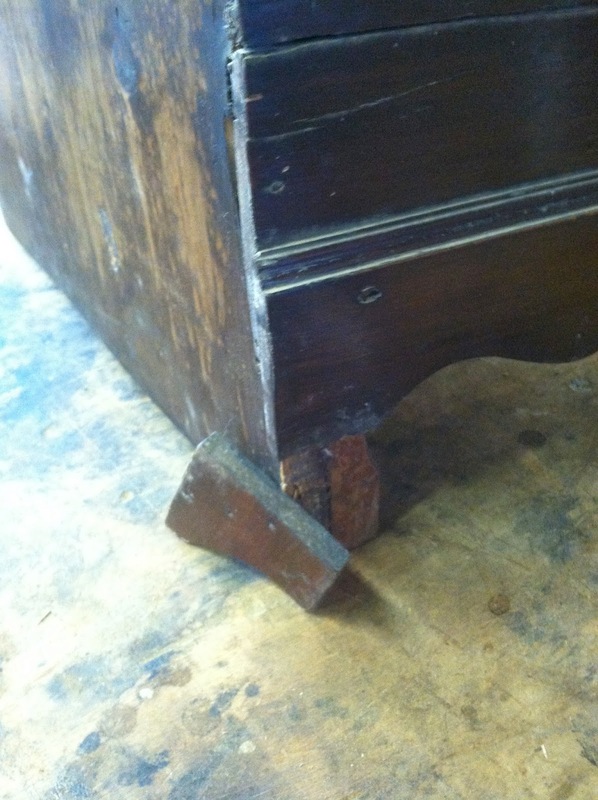 After this ground was built back up, the mahogany foot was reattched. 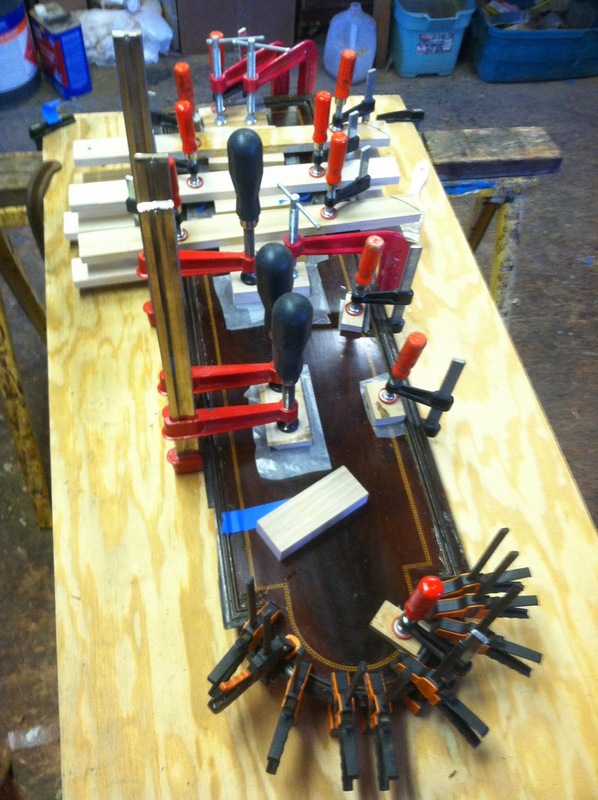 This photo shows the case being glued including the loose back as well as the feet being glued in place. After the case was stabilized, glue blocks were added to the interior side of the front to bring the face of the front flush and then a wedge was added to fill the crack in the front face. 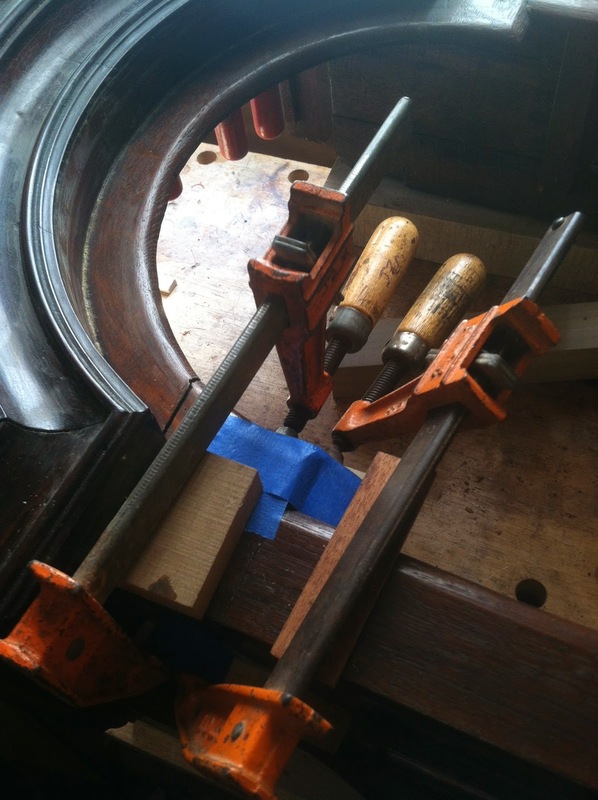 This photo shows the wedges around one of the sides as well as the cavetto molding that transitions to the waist section being glued. 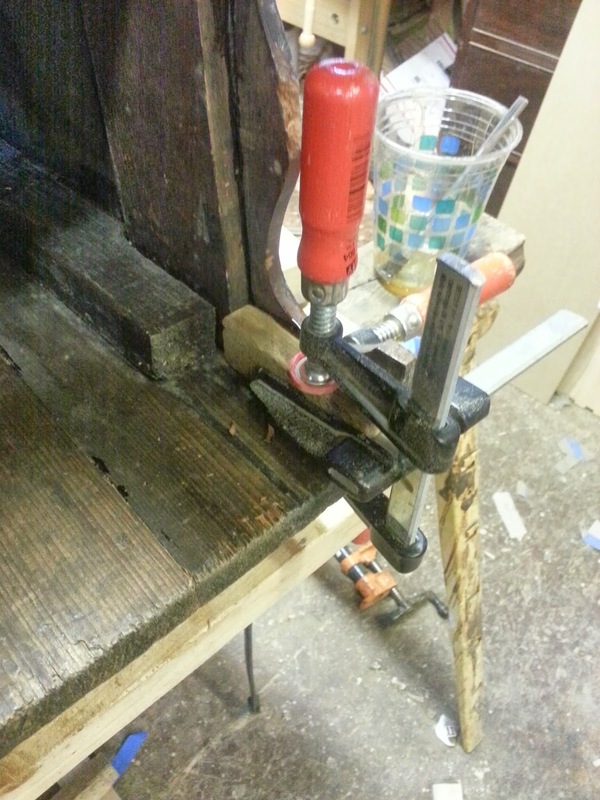 This last photo shows the replacement of a glue block on the back right foot. 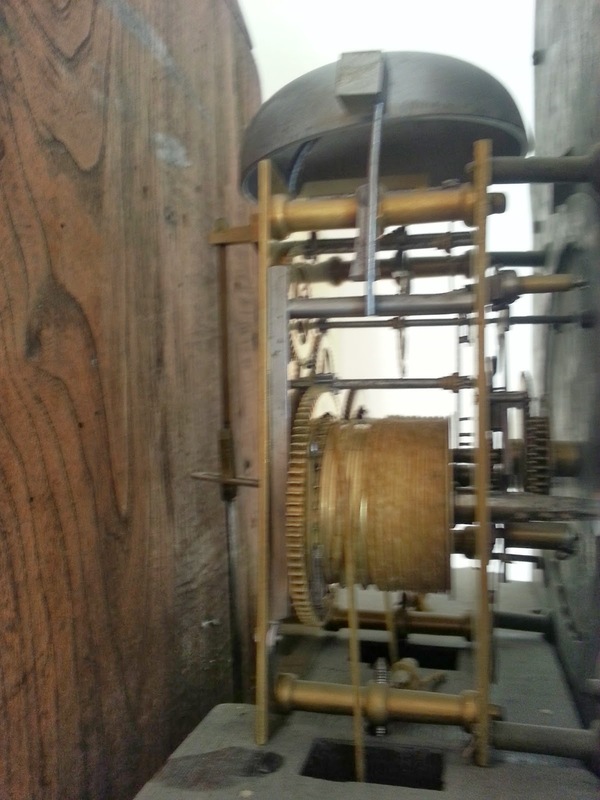 The waist section of the clock had loose and missing veneer as well as some structural issues that needed to be addressed. The photo below shows the bottom of the waist section that fits into the bottom of the case exposed. 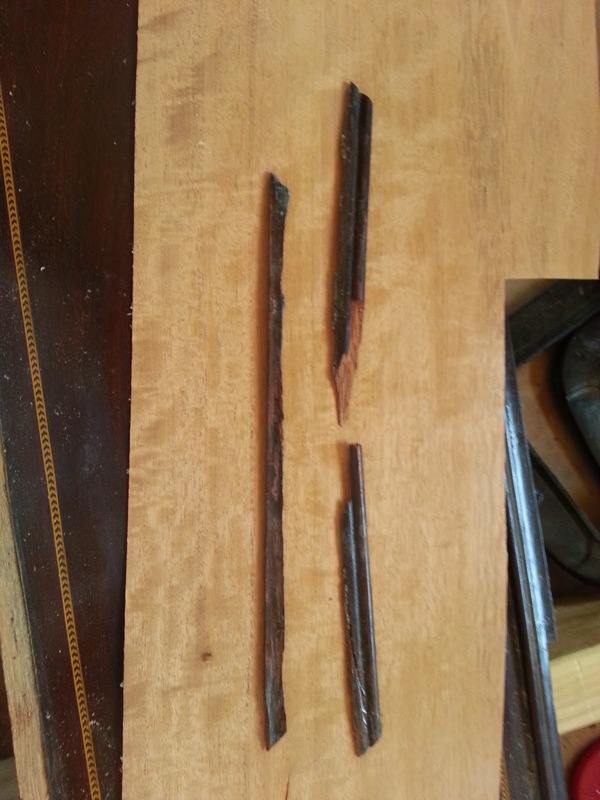 The nails from a previous restoration were removed and the old glue was cleaned so that the two sections could be glued together again. 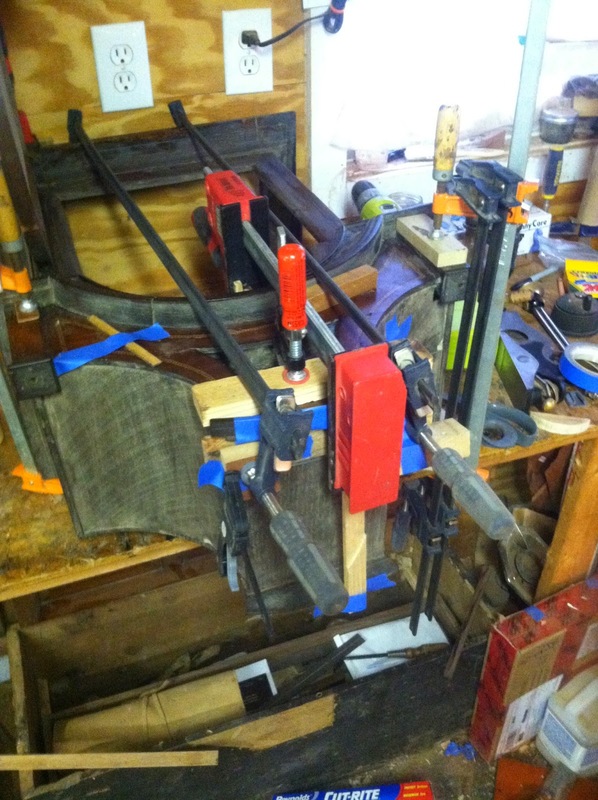 This photo shows the waist resting on its front and some structural repairs being made to the back and side. The waist door was a typical tombstone shape with applied molding around the edges and inset stringing to complement the base and bonnet. The door was made from quarter sawn oak and veneered with West Indies crotch mahogany. The applied molding was then applied around the edges onto the veneer. Over time the door had warped a bit making the veneer loosen in many places. In addition, the thin molding which overhung the edges of the door had snapped and cracked in many places. 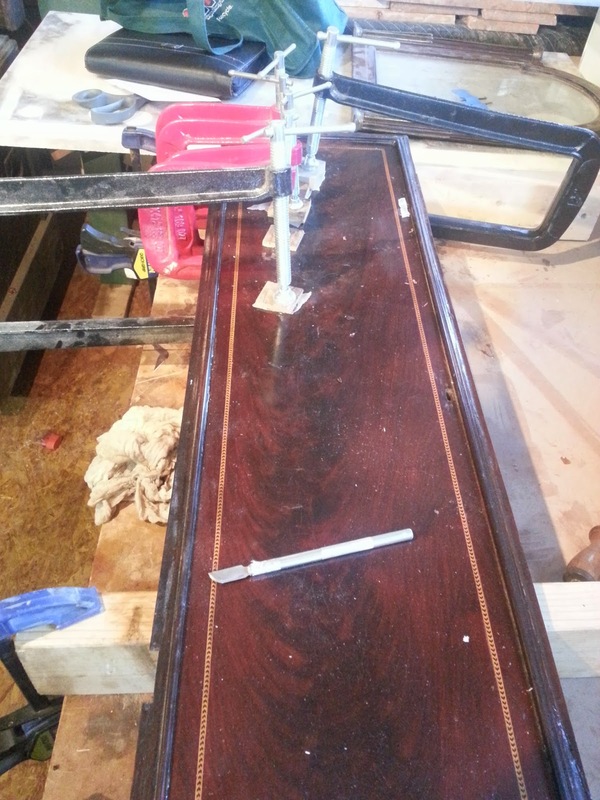 Several gluing sessions took place to glue all of the veneer down in the central part of the door. 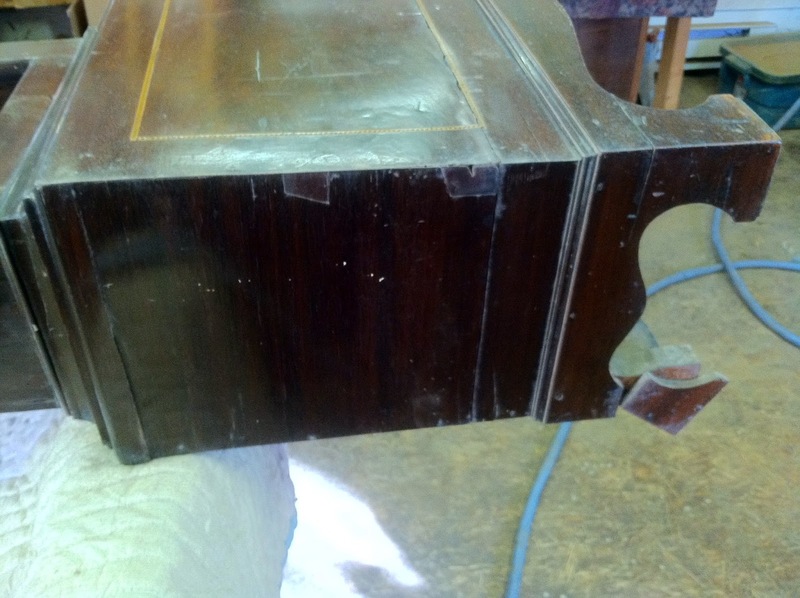 The photo below shows this as well as the curved molding being reapplied on the top of the case. 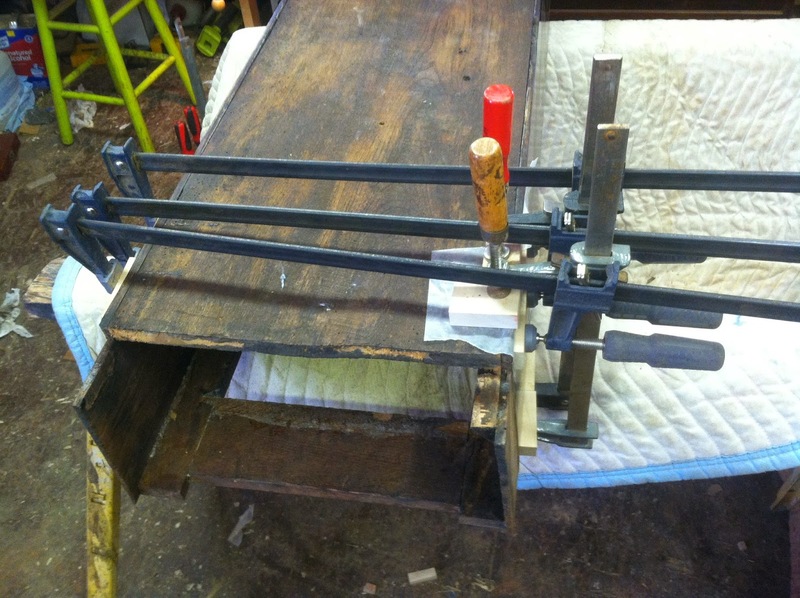 This photo shows a second, less extensive gluing session. As stated above, the molding was cracked and broken throughout. A long section was very broken on one side with small portions missing. The same was true with the bottom section of the molding. Rather than scrapping this and making new molding, I felt that with a little work this original molding could be salvaged. 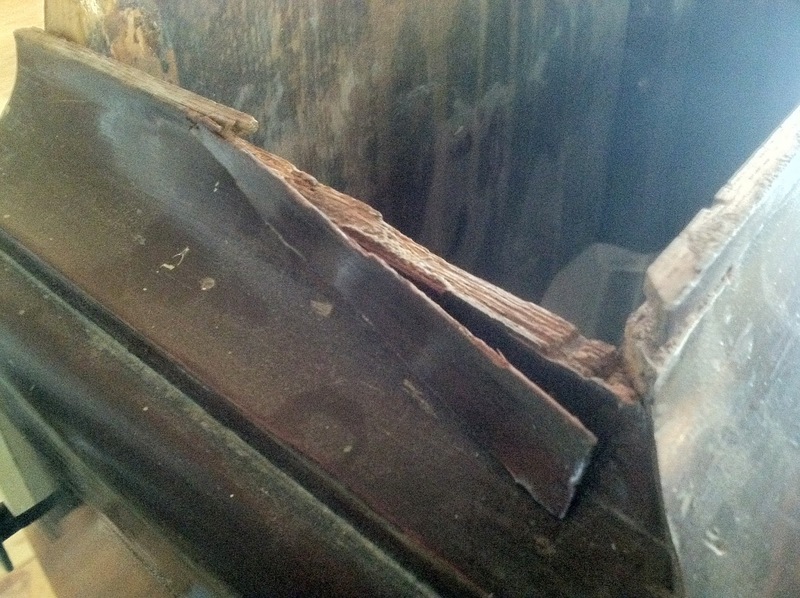 Below is a photo of the damaged molding. 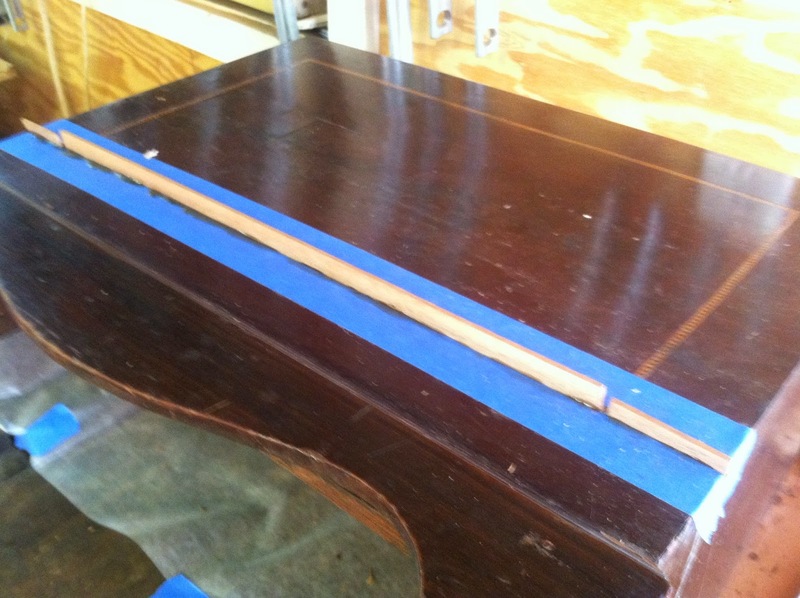 The first step was to remove the damaged molding and clean the old glue. Then I scored the veneer that rested below it and removed it from the door. This left the oak substrate exposed in this section. I was careful only to remove the veneer that lay under the molding and would otherwise be unseen. The photos below show these cleaned sections. 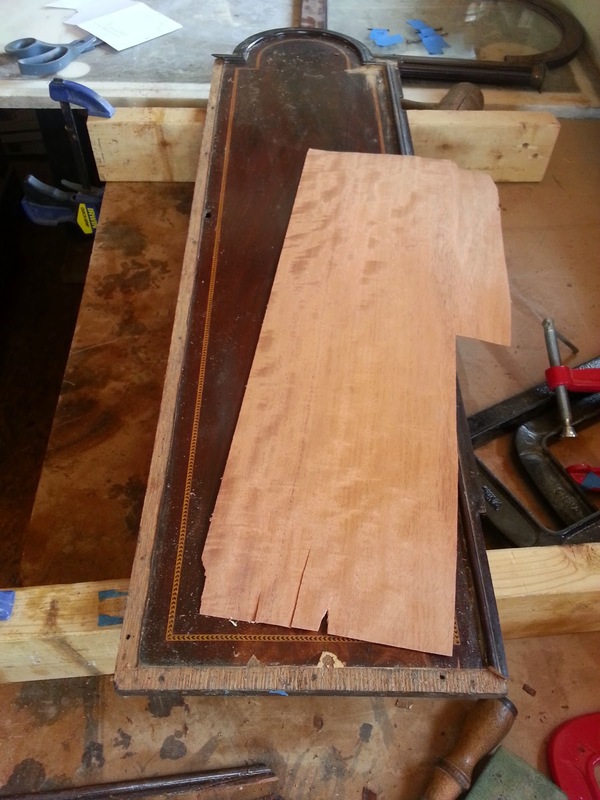 Apiece of mahogany veneer rests on the door that was later used in the repair. 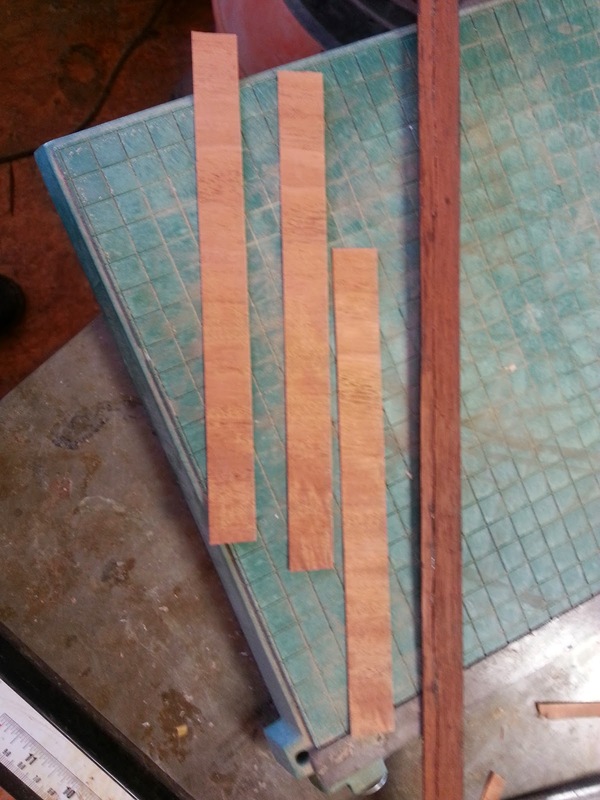 These fragments in the photo below are the bottom section of molding snapped into three pieces. This close up shows how the veneer was laid with the grain running perpendicular to the grain of the molding adding strength to the molding. 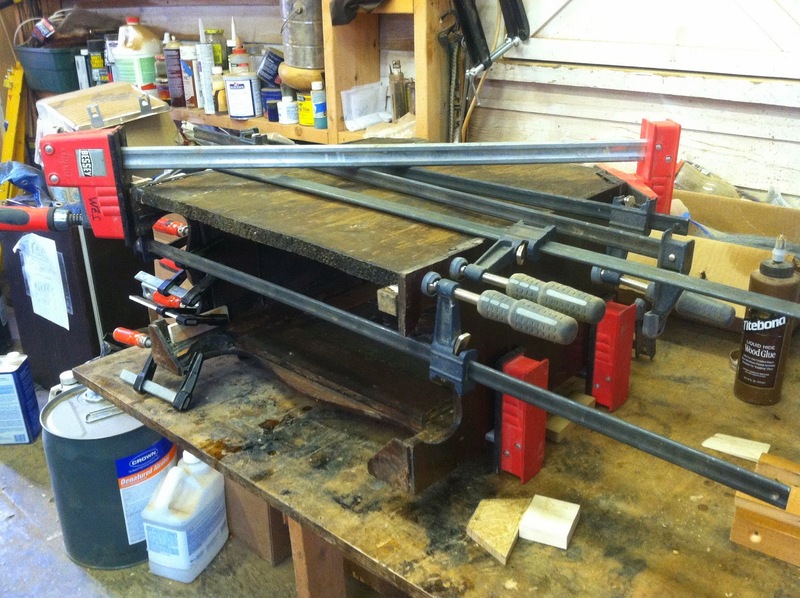 The next photo shows the long section ready to be attached to the door and then being attached to the door with the help of many small clamps. 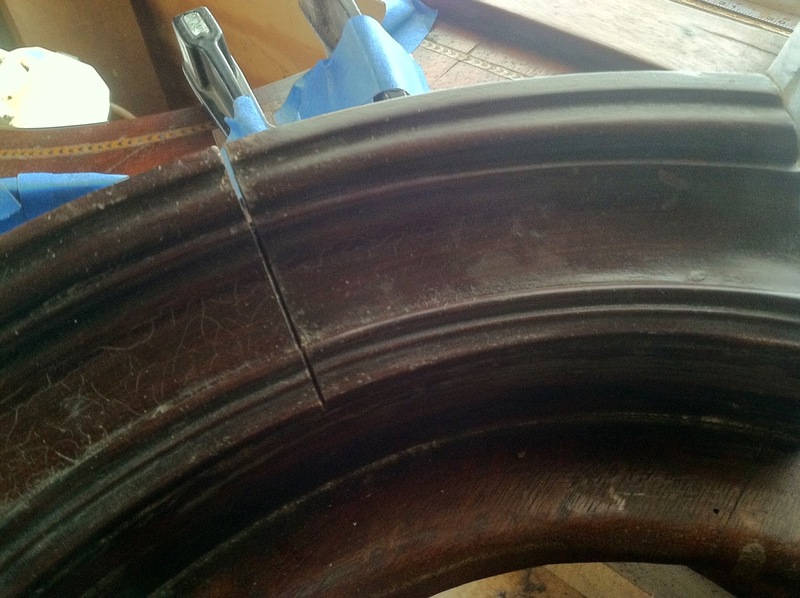 Once the glue dried this proved to be a strong repair and the molding was level with the other molding since I had removed the old venner prior to attaching the new. 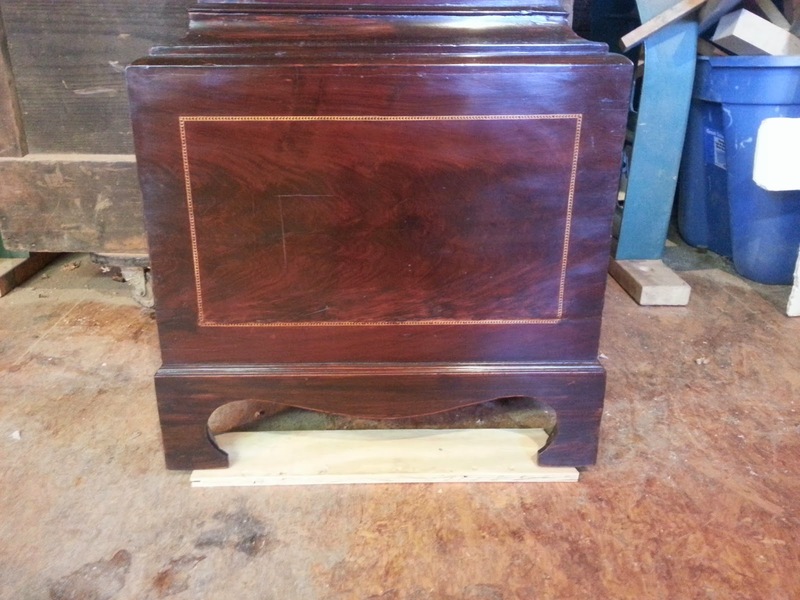 The bonnet had many loose areas and the top boards were completely removed and glued back in place. They were also lined on the interior with canvas to give strength to the thin boards. The photo below shows many sections being repaired. 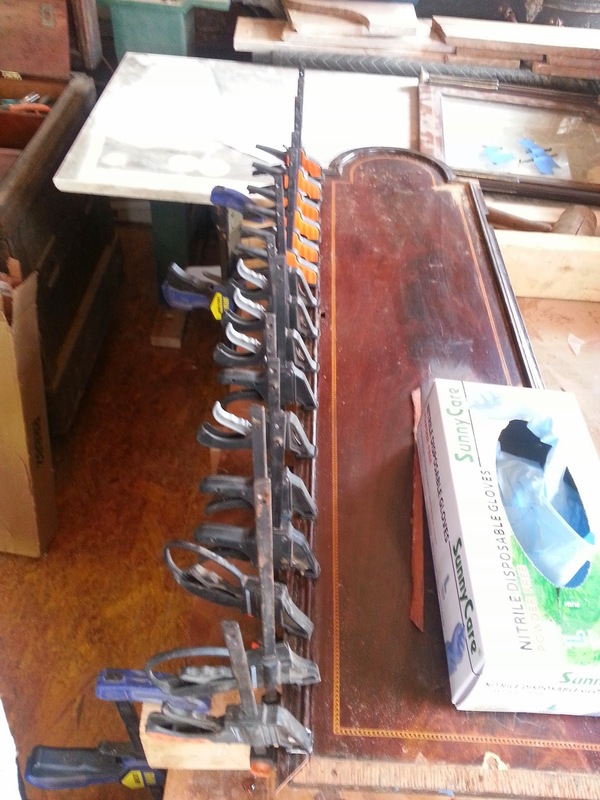 Since the glue takes a while to dry, it is important to do as much in one gluing session as possible. A close up of the same repairs. A crack in the molding that surrounds the bonnet door was stabilized with a wedge inserted with glue and then carved flush. This first photo shows the crack followed by another photo showing the wedge. The bonnet sides were composed of four boards to allow for sidelights (allowing the works to be viewed from the side of the bonnet). 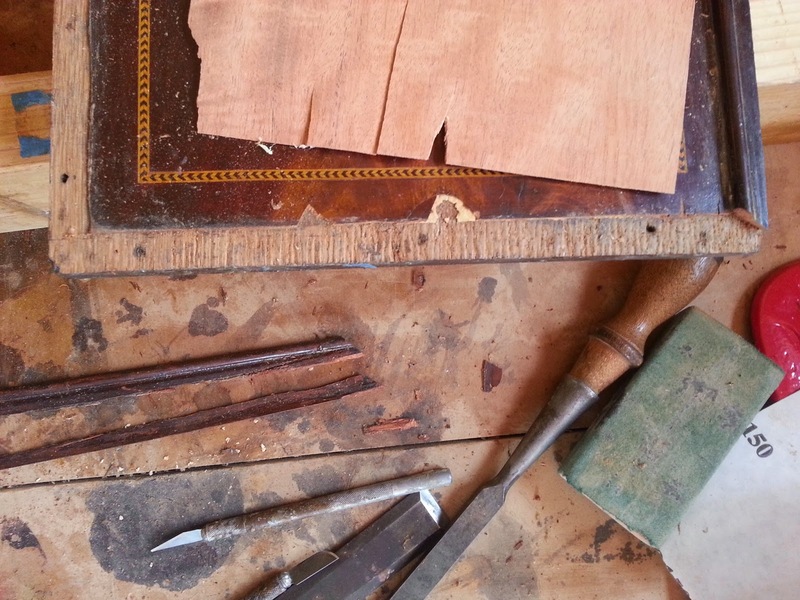 These boards were veneered over with mahogany. Over the years the board shrunk and cracks developed where the boards were joined. These were filled with wedges as seen below. 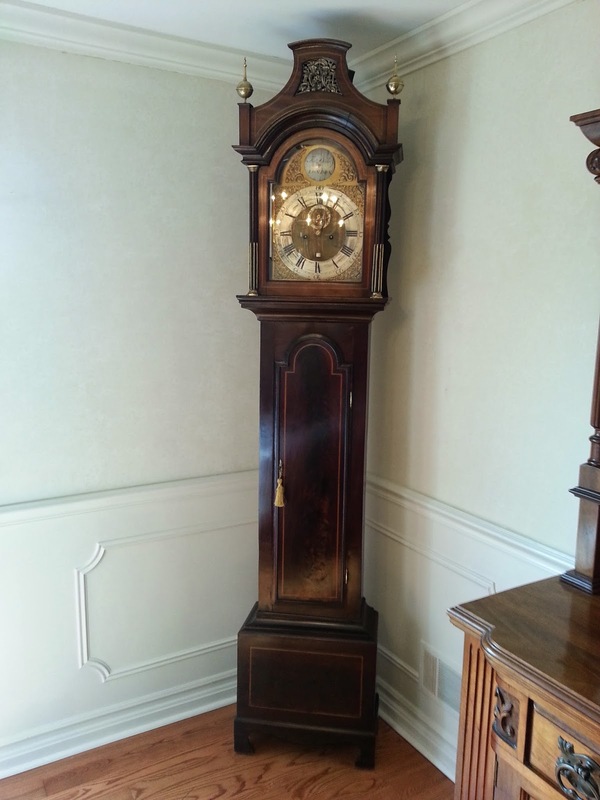 While this clock is certainly not "the plainest item", the idea that one piece of decoration can give definition to the overall style of a piece can be seen here in full force. 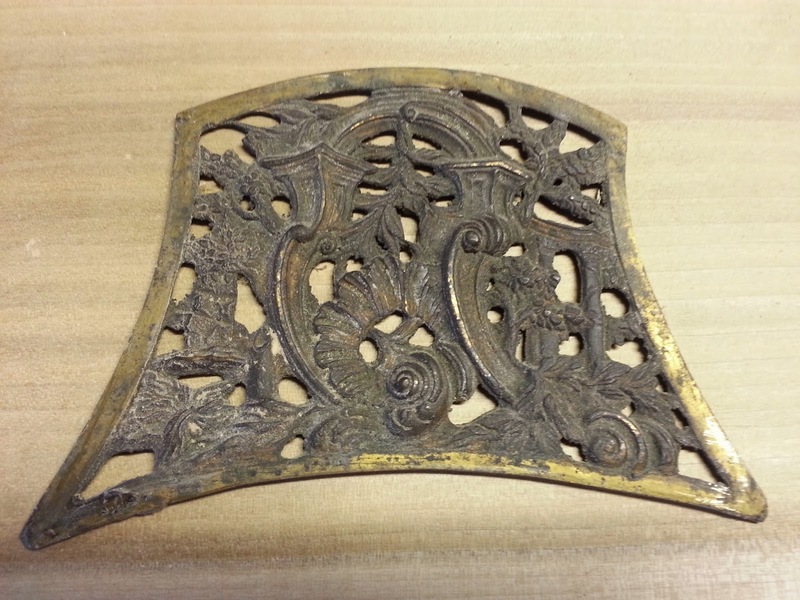 The cast sounding fret shows a plentiful array of scrolls and architectural elements that have a sort of asymmetrical symmetry that defined the rococo style. 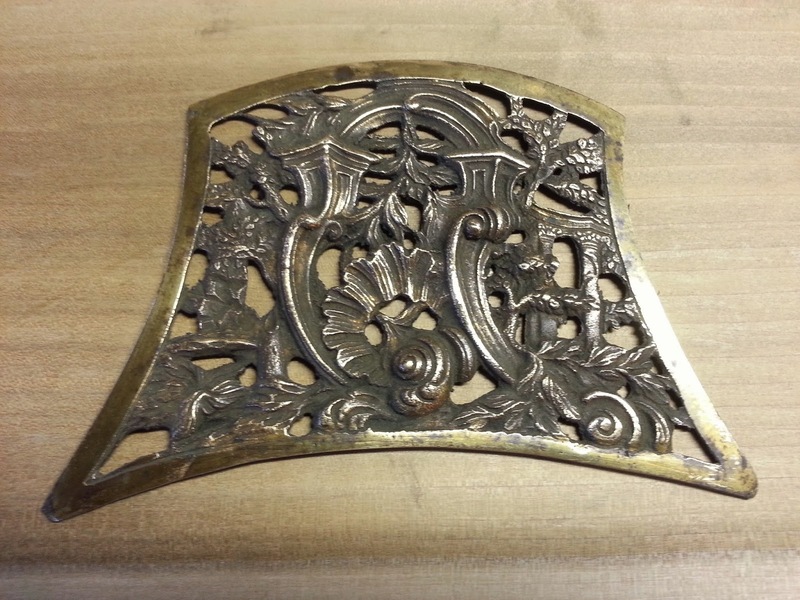 The break from the earlier baroque ideas of symmetry and order are clearly demonstrated and a statement of nature and its own balance that was so much admired by the artists and craftsmen of the 18th century is visible in this single piece of hardware. Nowhere else on the clock case is such sophisticated and detailed decoration seen. Likewise, the sounding fret has the effect of tying in the case to the face of the clock, which should rightfully be the focus of the entire piece. Below is a photo the sounding fret before cleaning followed by another photo of the cleaned hardware. 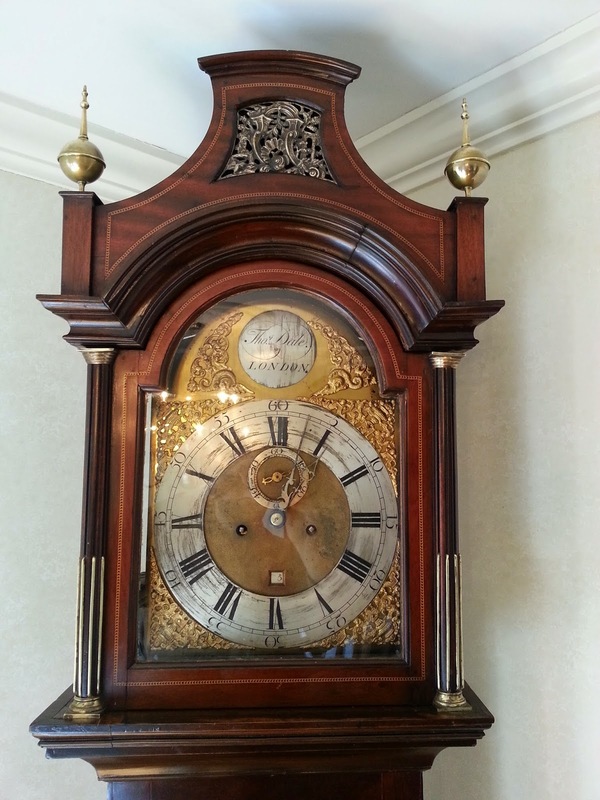 These last few photos show the completed clock after the finish was restored. The original finials were missing when I received the clock so new ones were furnished by Londonderry Brasses (http://www.londonderry-brasses.com/). 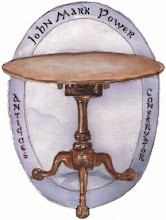 They were actually hand delivered with several others by the owner of the company who was passing through, and we fit different finials to the case until we found the right ones. Thanks Nancy! A closeup of the bonnet showing the sounding fret and the finials. 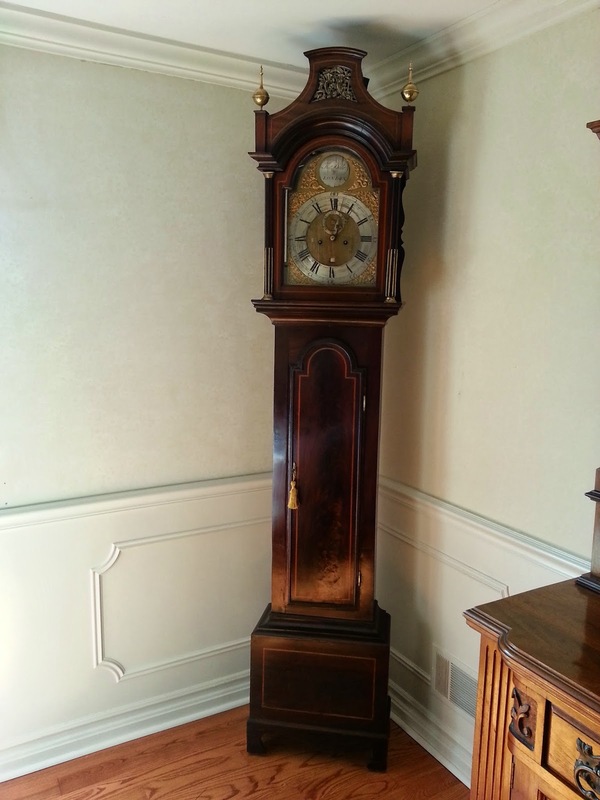 These last few photos show the clock at home with the works installed.